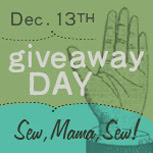 I've been looking forward to it - SewMamaSew is coordinating another Giveaway Day Monday December 13th. All the details can be found here. Then on Monday, visit their site again for a list of all the giveaways you can enter! I signed up to host one, so I need to go get creative with Serge and Singer. See you Monday! I'm signed up too, but haven't decided what to make yet - I'm sure it'll be a last-minute decision on Sunday afternoon! Have fun, I'm sure I'll be by to say hello on Monday!